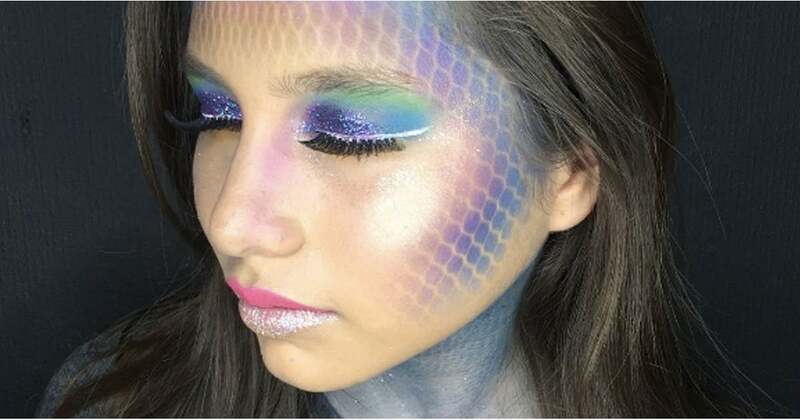 How To Wear A Dazzling Mermaid Makeup? Get Seductive & Glamorous Look! 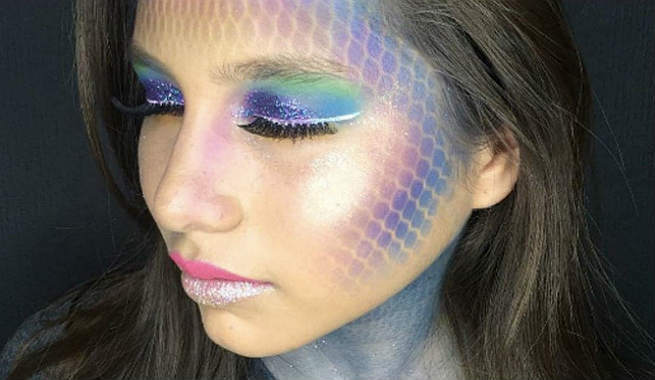 How To Wear A Dazzling Mermaid Makeup? Admit it. You have always been mesmerized by the beauty of mermaids. You also have dreamt yourself in those glamorous and seductive looks quite a few times. Well, how about recreating the exactly same look today? We bet you will be more than surprised to see yourself! 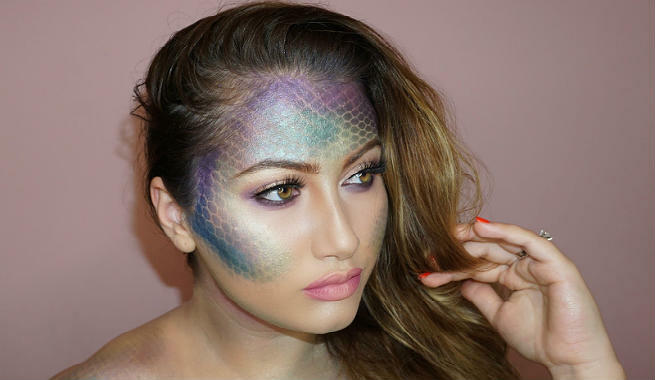 So, let’s try a captivating mermaid makeup. Get your face prepared first. Cleanse and wash with a mild cleanser and fresh cold water. Apply a toner if needed and then apply a thick layer of moisturizer to keep the skin soft, smooth and supple. Start with the basic face makeup. Apply a good primer that will make your makeup application a whole lot easier. You may also try a BB or CC cream or a suitable foundation in one or two shades lighter than your original skin tone. Also, make sure that you hide all your spots and blemishes with a perfect concealer. 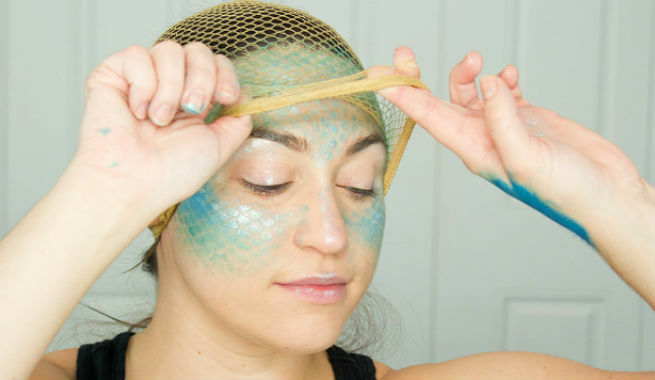 You will need a ‘fishnet’ mask for creating beautiful ‘mermaid scales’. It can be a stocking or a pantyhose or a mesh weaving cap or a wig cap. Just find out the most suitable alternative for yourself and place it over your face. Get a makeup sponge and a teal / sea-blue colored cream eyeshadow and start creating the ‘scales’ over your mask. Pick some shadow with the sponge and dab it onto your forehead, temple area, and the top parts of your cheekbones. You may also use your fingertips for this purpose. Blend in the shadow to some extent with the help of a brush. Also, create an ombre effect by using the makeup sponge. The shade should go lighter towards the center of the face. Take another cream eyeshadow in light-green and apply it right below the sections you have painted with blue. Blend it in as you go towards the center of your face. It is time to highlight your ‘scales’. So, take a silver-colored cream eyeshadow onto the tip of your index finger and tap it on the top of the highest points of your face lightly. Now, remove the fishnet mask and your ‘mermaid scales’ are ready! Take some sea-blue cream eye shadow on a brush and apply it all over your eyelids. Blend it nicely to create a smooth, even effect. Extend the shape of your eyes at the external corners for a more dramatic look. Do not forget to blend the shadow out the top edges of your eyes. Take help of a scotch tape in order to ensure a neat, clean, and perfect application. Find a good metallic eyeliner in the shade teal or aqua blue and line your bottom lash lines with it. While drawing the lines, elongate them carefully past the outer corners of your eyes. Take another eyeliner pencil in a different shade, such as turquoise or mint-green, and apply to your waterlines. This lines should be drawn past the outer corners of eyes right below the teal / blue lines. Once the eyeliners become completely dry, give your eyes a shimmery effect. Dip the tip of your index finger in a glitter adhesive and a pot of deep blue glitter flecks respectively, and press onto the eyelids. Add a touch of sparkling silver to your eyes by applying a silver-colored glitter eyeliner along your upper lash lines. Curl up your own eyelashes or simply apply a pair of beautiful falsies. Adding some feather accents to the external edges of the eyes will also do. Apply thick coats of a volumizing mascara to both your upper and lower lashes in order to pump them up. To finish off, apply a glitter primer to your eyebrow hairs and sprinkle some loose silver-colored glitter over them. The teal eyeliner pencil you used for lining your eyes will be helpful for lining your lips too. Follow the natural shape and outline your lips accordingly. Take a small piece of sponge and create an ombre effect so that the shade becomes lighter towards the center of your lips. Now, take the mint-green eyeliner pencil and fill the space you left blank at the center of your lips. With the help of the silver-colored glitter eyeliner, highlight your cupid’s bow carefully. Finally, add a touch of sparkle to your lips by pressing some silver glitter flecks to the center of the lower lips, and voila! 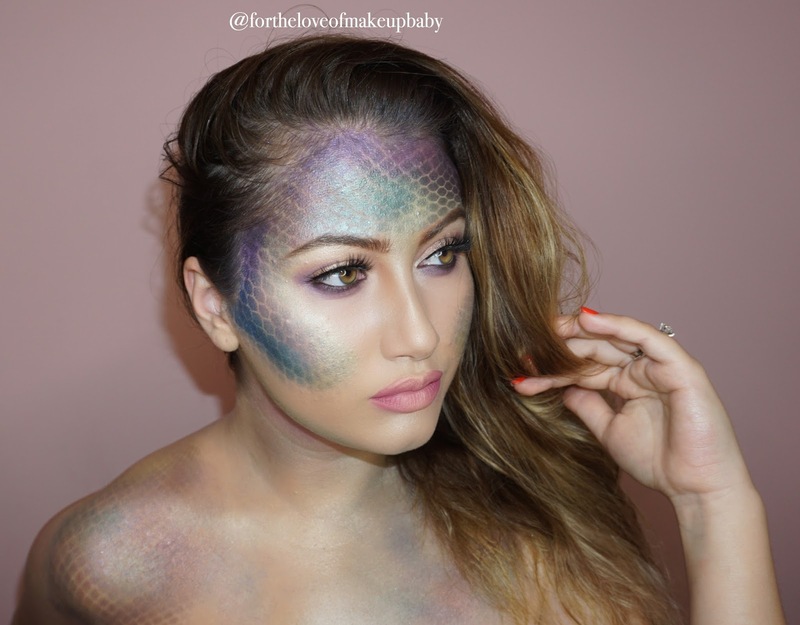 Make sure that all your makeup products are smudge-proof or waterproof even though it is a ‘mermaid’ look! Choose bright aqua colors that will be contrasting enough. You may also add a dash of pink or purple to your eyebrows, eyelids, and lips. For added oomph, apply some silver glitter underneath your eyes focusing on the outer edges. Can you recognize your inner mermaid now? Are you ready to swim off?